On August 4, 1892, Andrew Borden and his wife, Abby, were found hacked to death in their Fall River, Mass. home. The top suspect: Andrew’s daughter, Lizzie, who was acquitted but thereafter lived under the shadow of the crime. Why was Lizzie accused, and how did she beat the rap? Let’s take a look. Tension had been growing in the family in the months before the murders, especially over Andrew’s gifts to various branches of the family. After Abby’s relatives received a house, the sisters demanded and received a rental property—which they later sold back to their father for cash—and just before the murders a brother of Andrew’s first wife had visited regarding transfer of another property. The night before the murders John Vinnicum Morse, the brother of Lizzie’s and Emma’s deceased mother, visited the home to speak about business matters with Andrew. Some writers have speculated that their conversation—particularly as it related to property transfer—may have aggravated an already tense situation. With the despised Andrew and Abby out of the way, Lizzie and Emma stood to inherit an estate which, adjusted for inflation, was worth around seven million dollars. Worse crimes have been committed for far less. 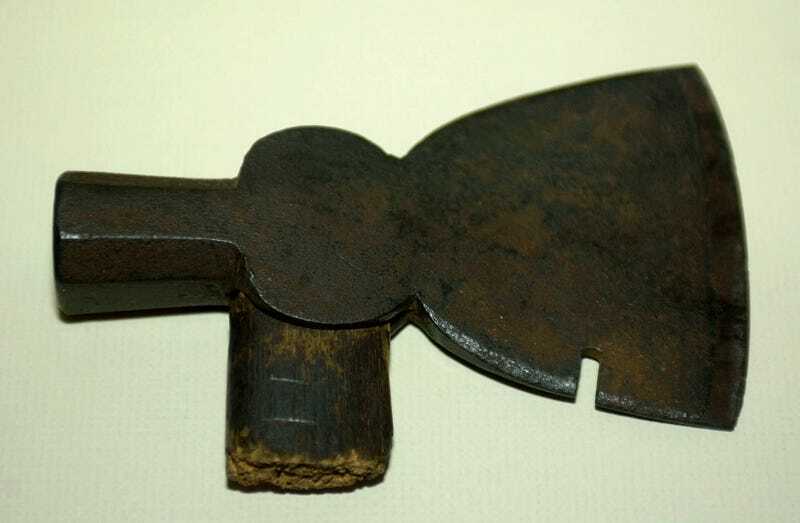 Though no forensic evidence was ever found to tie Lizzie to the crimes—the clean, handle-free hatchet blade pictured above was found in the basement, which was the only reason it was suggested as a murder weapon—she did engage in unusual activities leading up to, and after, the events of August 4. She’d been seen attempting to buy poisonous prussic acid, ostensibly for cleaning purposes, just before the murders, a fact deemed inadmissible at trial though it seemed to support the theory that Lizzie had murder on her mind. And: she admitted to burning what she described as a paint-stained dress just days after the crime occurred. The strange bit of housekeeping was witnessed by her friend, Alice Russell, who cautioned her against doing it. Since the vicious nature of the killings meant whoever wielded the axe would have been covered in blood, and would have to destroy his or her clothes (or have done it buck naked) to avoid suspicion, incinerating the dress was seen as fishy at best. At the time of her mother’s murder (around 9:30 A.M.), household guest John Morse was visiting relatives, sister Emma was out of town, Andrew Borden was running errands around town, and maid Bridget Sullivan was outside washing windows. Only Lizzie was known to be in the house at the time of Abby Borden’s murder. To commit both murders (Andrew Borden was murdered around 11 A.M.), an outside intruder would have either have had to hide in the house for 90 minutes or departed and then returned without being seen. Police found the loft so stiflingly hot that it was difficult to believe anyone would voluntarily remain in such a place for as much as 20 minutes. They also found no footprints in the loft that could substantiate Lizzie’s story. According to Miss Russell, Lizzie was agitated, worried over some threat to her father, and concerned that something was about to happen. “I feel as if something were hanging over me and I cannot throw it off,” she told her. She added that her father had enemies and that she was frightened that something was going to happen to the family. The sensational two-week trial, held nearly a year after the murders in June 1893, grabbed headlines and gallons of ink for its many dramatic moments. A big one: when the chopped-up skulls of Andrew and Abby were presented as evidence, Lizzie fainted in court, gaining sympathy from the masses. She was a petite Sunday school teacher, after all. How could she have done such a brutal thing? She never testified, and like the prussic acid story, her earlier conflicting statements were judged inadmissible, partially because it was revealed she’d been on morphine, prescribed to calm her nerves, while giving them. Though theories abound (the biggest one, of course, is still “Lizzie got away with murder,” which began gaining steam immediately after her acquittal), no other suspects were ever arrested, and the killing remains officially unsolved.